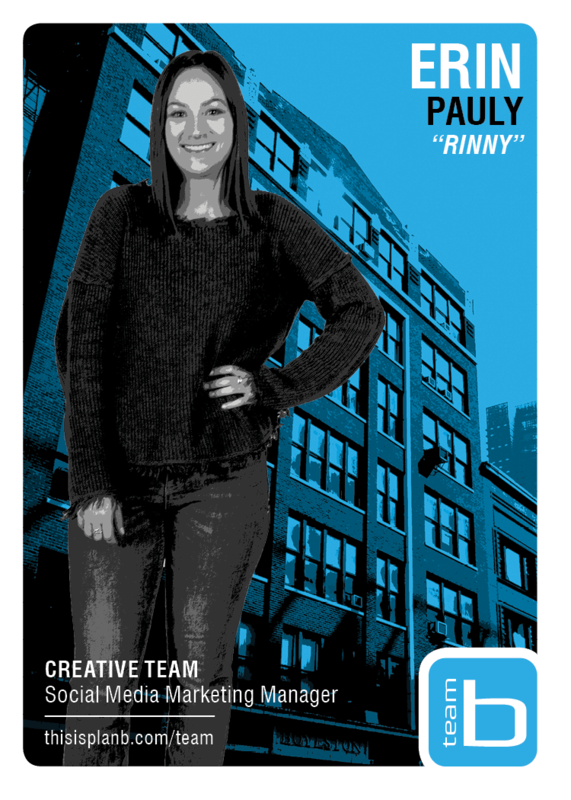 Erin is our social media wiz, and we are #B-yondexcited to have her! She discovered her passion for social media at West Virginia University with a major in Public Relations. She then gained experience working at Maty’s Healthy Products and Social Sparkling Wine, where she honed her skills by learning and mastering Hootsuite and similar systems. Here at Plan B, Erin works as our Social Media Marketing Manager, assisting in the social media strategy, optimization, execution and engagement for clients like Tru Vue, Tandy Leather, and Zip Water. Erin is extremely optimistic, believing that the greatest ideas start small, and grow into something extremely promising as they progress further into the creative process. This Chicago newbie is very enthusiastic about exploring the city. She even has a bucket list of restaurants, comedy shows, and venues, following her trusty Instagram mavens as her guide. You can also find her skiing, cooking, or joining in fitness classes, especially spin (she’s #B-yondexcited to work on the Keiser account)!